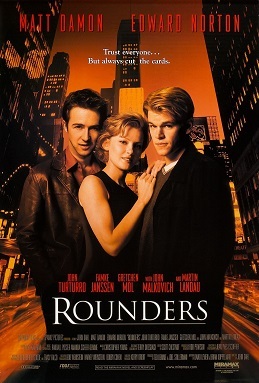 Twenty years ago, the film Rounders brought the poker variation known as “no-limit Texas hold'em” to the wider public consciousness. The movie inspired thousands of home-game players to pursue the game, including a young Tennessee accountant named Chris Moneymaker, who achieved his own “Hollywood ending” by winning the 2003 World Series of Poker Main Event and launching the decade's “poker boom”. If you've ever watched the TV coverage of no-limit hold'em poker tournaments, you've seen how dramatic some of the confrontations between players can be. If you watch closely, you can see how the action of these high-stakes tournaments can add intrigue and tension to your story. One of the most dramatic aspects of TV poker tournaments is the tension that the players show as they must make a crucial decision. In most cases, the player will remain silent for minutes at a time while they deliberate whether to fold their hand, call the bet, or raise the stakes. While such a long silent period in a screenplay may not always work, screenwriters should understand how to create tension from the situation, rather than from extensive dialogue. Since poker players are not allowed to tell the truth when asked about their cards during a hand, screenwriters should apply that rule and put their characters in positions that require them to lie and increase the tension in their scenes. Another appealing aspect of TV poker tournaments is the “hole card cam”, which allows the TV viewers to see the cards each player holds. (NOTE: The "hole card cam" was invented by Henry Orenstein, a Polish immigrant and Holocaust survivor who also helped launch the "Transformers" toy line in the U.S.) While the audience is privy to this information, the other players aren't. This information allows the audience to recognize when a player is bluffing, or when they have the best hand, which keeps the viewer invested in watching the results. While many rookie writers value the “twist” ending, this technique can come across as more of a way for the writer to show off, rather than a way to keep the audience engaged. The classic horror trope of showing the killer on one side of the door and the soon-to-be victim on the other has kept audiences engaged for decades. Not only is it not a sin to reveal information to the audience before the characters know, it can keep the audience riveted to see the character's reaction when they find out. After each player receives their two hole cards and decides whether they want to stay in the hand, the dealer puts out three cards on the table, face-up, for each remaining player to use. These three cards are collectively known as “the flop”. After another round of betting, the dealer puts out a fourth card, called “the turn”. Another round of betting ensues, and the dealer puts out the fifth community card, called “the river”. The remaining players show their hands in a “showdown” at the end of the hand. This structure bears a resemblance to the “three-act structure” often taught in most screenwriting classes. The character starts off with the hand they're dealt, and must make a decision to proceed with their journey. The character “flops” into a new situation at the start of Act II and encounters new allies (a strong hand) or new enemies (a weak hand). The story takes a “turn” at the midpoint of Act II, then the character takes a trip down a menacing “river” at the start of Act III, leading up to a “showdown” with the antagonist. In no-limit hold'em, two players are required to make minimum “blind” bets before the hand starts to ensure that at least some chips are already in the pot. In tournament play, the minimum bets increase at specific time increments. As the blinds go up, the player's holdings get relatively smaller, even if they maintain the same amount of chips. The increasing minimum bets force players with "short stacks" into desperate moves to stay alive. In all types of fiction, but especially in screenwriting, stasis equals death, at least the death of the audience's interest. When the character chooses to stand still, the world will still move on around them—and, quite possibly, run over them. The writer must keep the character moving, either physically or emotionally or both, to keep the story going and to maintain the audience's interest. When the final two players of the tournament remain, they face off in “heads-up” play. These final hands are often as much about will and skill as they are about cards and chips. The final two players may have clashed previously over the course of hours or days, but now it's for all the marbles. Whether it's poker, boxing, MMA, or tennis, audiences love to see a great one-on-one matchup. The same appeal holds in screenplays. Whenever the writer can set up a climactic confrontation between the protagonist and the antagonist, whether that confrontation uses fists, guns, legal tactics, or emotional manipulation, the audience will want to see who wins. The most thrilling part of any no-limit poker hand is when one player bets all their chips on a single hand. If they win, they double up and stay in the tournament. If they lose, it's “Wait Til Next Year.” This moment comes when the player says two simple words: “All In”. As a writer, you have to risk a lot to put your story on paper. You have to risk putting in long hours for little or no reward. You have to risk missing out on fun times with friends and family to work on your story. You have to risk feeling like your story isn't good enough for anyone to want to read or see. Just like in poker, the only way to win at the screenwriting game is to go “All In”. If you want your story to be a winner, Story Into Screenplay offers a wide range of script services, including coverage reports, rewrite services, and both live and online hourly consultations. You can email Story Into Screenplay at storyintoscreenplayblog(at)gmail(dot)com, or send a message through the Facebook page.